*Wonderfully Messy Mom received this product in exchange for a review. I am pretty picky about what I put on my face because I suffer from acne so bad. I had to so some digging to find out if this would be a good product to try. I liked the ingredients that I saw so I went for it. The ingredients: 20% Vitamin C + Vitamin E + 11% Hyaluronic Acid + Ferulic Acid. Also contains Organic Aloe + Advanced Amino Complex + Organic Jojoba Oil. What made me really go for it was this: 98% Natural, 72% Organic. Contains No Alcohol, No Parabens, Gluten Free, Plant Based, No GMO's, Cruelty Free and Never Tested On Animals! With all the nasty chemicals in most products, I had to give this company a try. I am not to disappointed in the results. My normal skin care routine is very simple. I wash my face in either honey or just a warm wet washcloth to wipe my face down. I have been using this on my face once a day to see what would happen. I started out with a small patch test to see if I would break out or have a reaction to it. Nope, I was good to go. After washing my face I apply this to my entire face. It dries fast and leaves my face feeling extremely soft! I have not felt my face this soft since I was a pre- puberty teen!! I cannot say for sure if it is healing my acne spots when they come, but I have not seen any new ones!! With all the great components to this serum I can bet it's keeping them away!! The vitamin C protects your skin from sun damage, reduces fine lines and wrinkles and is said to plump up your skin cells. If I had to give this a numbered star rank, I would give it a 4 stars **** out of five. I really like that the Vit. 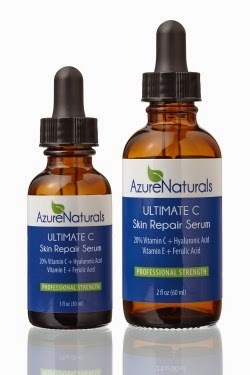 C protects your skin and can reduce fine lines. Great review! Thanks, I am loving this stuff! I like trying more natural beauty products. Thanks for the review! I love the way my face feels after it dries. That is the best part! This stuff looks really great, thanks for letting us know about it! Thanks for the review, I wish this stuff had been available when I was a teenager because my skin was really bad. I wish I had know about it too!! I could have saved myself some major heartache!